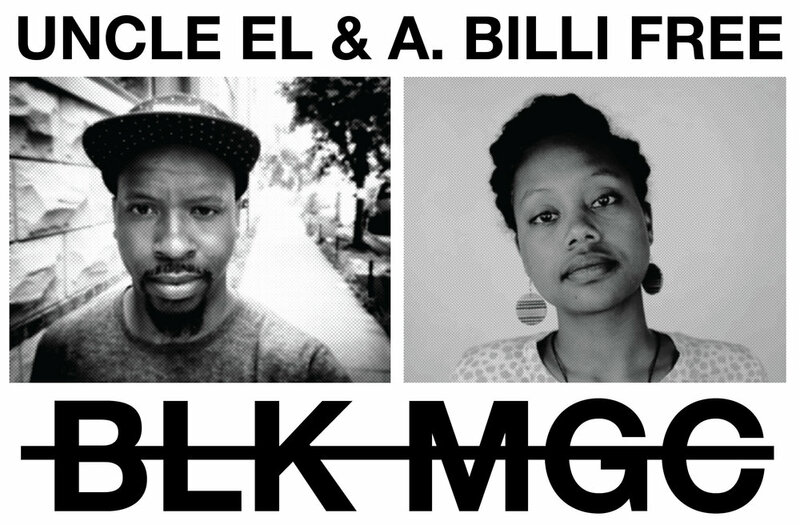 BLK MGC is an RnB/Soul duo comprised of vocalist A. Billi Free and producer Uncle EL. The pair recently dropped their debut 7-song EP "Cnjr", which includes the very dope track "Hackers Step", which is featured on this site as well as our partner site Dopecausewesaid. We connected with A. Billi Free and Uncle EL for an exclusive interview to discuss the "Cnjr" EP, the difficultly of working on music in two different parts of the country, and much more. After reading our Q&A with BLK MGC, be sure to connect with them on social media and stream/download "Cnjr" on Spotify. Tell us about how you two met and decided to form the musical duo BLK MGC. Also, break down what the name means. A. Billi Free: El and I have known each other since, like, 2007ish. I was a part of a hip-hop/EDM band called The Bees Knees in Chicago and he was a DJ/Producer/Emcee and promoter in the city. We knew a lot of the same people on the scene at the time and he booked our band for a couple of shows back then. Myspace, Facebook and all the other social media channels helped us keep in touch throughout the years after I moved to the Southwest. In 2016, El booked me for a show in Chicago but we also sat down and went through some of his beats together thinking we’d do a couple one-offs. I wrote to those and he sent me a few more which turned into the EP. It’s funny to think of it now because it was actually more difficult to come up with a group name and album name than it was to make the songs, which came first. Uncle EL: That was definitely a great time for networking, around the Chicago area. Everyone was hungry, playing shows and sharing resources. As far as the name BLK MGC, as it started to become a project, I wanted to call it something that signified the Black creative renaissance that had been surging for some time. Given the nature and distance of this collaboration, my first thought was the idea of creating something out of nothing, i.e. conjure (CNJR). When someone listens to a BLK MGC song for the first time, “Hackers Step” for example, what do you want them to take away from the experience? A. Billi Free: I want them to want to listen more, especially if they only have listened to one track. “Hackers Step” and the entire project, really, has a lot of replay value and, in my opinion, is very easy on the ears. The more it’s played the higher likelihood that a message for that listener comes through in the beats, the lyrics or just the overall sound of the track. Uncle EL: I’d like for them to feel like they’d just taken a trip. The feeling of zoning out and floating away for a bit. Congratulations on your debut EP “Cnjr”. It’s a very dope project and I have a hard time picking a favorite song, which is a great problem to have. How hard was it creatively to develop the project while in two different parts of the country? A. Billi Free: Since El made the beats first all I had to do was sit down and write. As mentioned, we didn’t have a name or a theme at the time so I was just creating to the movement of the instrumentals. We are fortunate to be making music in this time of technology as the emails, texts, Google Drives and WeTransfers have all helped the communication needed to complete this project. I also think that we are both seasoned in not only the creative aspect of making music but also the business of making music and bringing a project to fruition so I’d be like, “I finished this part of the puzzle” and El would be like, “Ok, I got the next piece” and we’d just keep passing the baton. Uncle EL: To add to that, with Billi’s strong work ethic and the way she was able write and record to the beats, with very few edits, it honestly felt like a breeze. With the release of the EP behind you, what’s next for you guys? A. Billi Free: Right now, we are trying to get the project into the ears of more listeners. I perform most of the songs in the Southwest region but we’ve got plans in the works to perform together live at festivals in Chicago and the like. Also, hoping to tour the project soon. Tell us about the artist collective MachineWashmusic. How does being a part of this collective help you as artists creatively? A. Billi Free: Machine Wash Music has helped us move through a lot of the post-production process and I’m very grateful. I’m usually a lone wolf, but it has been very nice to have the additional support on graphics, distribution, release plannings, etc. It is also heartening to have a group of folks behind you that genuinely like the project and want to see it grow. Uncle EL: It’s great having a supporting team behind our efforts. Also, it helps that I’ve known the founders of Machine Wash since college. When it came to looking for labels to release the project, it made perfect sense to work with them.